Perhaps the best example of the evolving As-a-Service delivery model that immerses all the value levers of global delivery; namely offshore talent, cognitive automation tools, analytics and the digital customer experience, can be found in the burgeoning mortgage processing industry. With banks going all out to sell highly competitive mortgages at record low interest rates, the onus to manage the whole process both efficiently and intelligently, while battling all the regulatory demons, has never been so great. 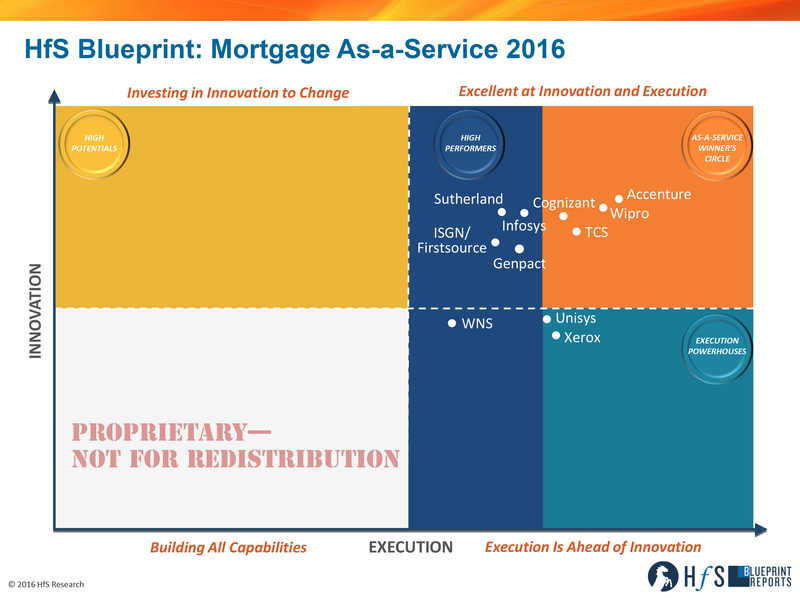 Two years after our inaugural Blueprint in Mortgage BPO Services, we took a fresh look at this industry… here’s announcing the findings of the HfS 2016 Mortgage As-a-Service Blueprint, led by HfS banking analyst, Reetika Joshi. The concept of delivering mortgage As-a-Service, using plug and play digital business services is still in its infancy. We’re not quite at “push button, get mortgage” as an industry – and the verdict is out on whether this is the right message to send for a lending environment that is still rebuilding itself, seven years after the 2008 housing crash. How do you do this without raising eyebrows? You’ll have to ask Quicken Loans, as they learn from the backlash of their Super Bowl campaign with that very slogan. Reetika, how do you view the 2016 Service Provider Landscape? 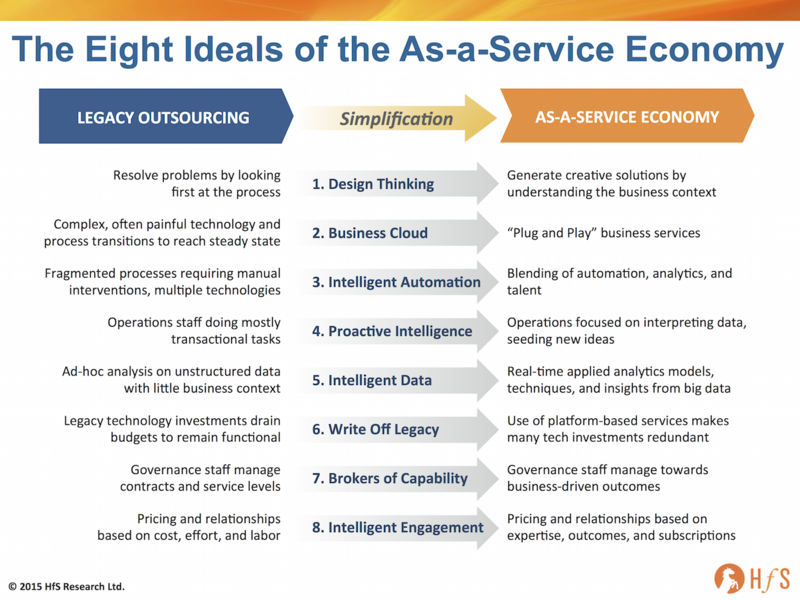 Our HfS Blueprint methodology assesses service providers based on two critical axes: Execution and Innovation. We gather data to support our analysis from client reference interviews, market interviews, RFI submissions and exhaustive service provider briefings. In this Blueprint, we identified four As-a-Service Winners: Accenture, Cognizant, TCS and Wipro. These service providers have the strongest vision for As-a-Service delivery in the mortgage industry, and are driving collaborative engagements with clients to bring this vision to life. They are making significant investments in future capabilities in automation, technology and borrower experience to continue to increase the value over time. The High Performers in this year’s Blueprint are a highly competitive set of service providers: Genpact, Infosys, ISGN/Firstsource, Sutherland Global Services and WNS. They have high execution capabilities and are growing their client bases as a result of investments in future capabilities and innovation. These service providers have the pieces in place for As-a-Service delivery, and need to focus on consistently bringing these capabilities to clients and scaling up with broad, multi-client solutions. We expect them to challenge the Winner’s Circle leaders in the next couple of years, with each building on unique strengths and assets in this vertical. Why does mortgage needs to have a different approach and response to “digital disruption”? Despite this sensitivity, other industry forces still march on; regulation, homebuyers and a new breed of disruptive fintech firms are steadily shifting the entire mortgage industry towards generally being more digitally enabled. Lenders have this big ask today: how to carefully balance their investments in new technologies, with changing consumer needs, volatile rate environments with rampant M&A, their company’s own appetites to write off/augment internal legacy systems, and all while continuing to remain compliant in an increasingly watchful regulatory environment. The use of digital technology can greatly help lenders to achieve these experiences, in both facilitating interactions and in creating operational efficiencies at the back-end to speed up applications and free up loan officers’ time. In becoming digitally driven, lenders have a long way to go in thinking about e-mortgage beyond digitization, and borrower experiences that are built on new engagement strategies, especially as the market shifts to more purchase originations and persistent refinancing dictated by flat-lined interest rates. So what’s fundamentally changed, since the inaugural Mortgage Operations Blueprint in 2014? There is a marked departure in the market dialogue, away from labor arbitrage and manual “lift and shift” processes, and towards using a combination of technology platforms, analytical insights, automation, digitization and other accelerators to redesign processes and drive more value in sourcing engagements. With greater purchase originations, we see the mortgage operations market more broad-based in the work sought from lenders. Accordingly, service providers have grown both their technology and process capabilities in originations and servicing in the last two years, with a few that have foreclosure and default management work today. Great examples of service provider capability in creating and embedding analytical insights and data into different parts of the mortgage value chain, understanding the key triggers/outcomes in the process such as predictive modeling for loan origination to help prioritize underwriter time and understand likelihood to close. New services and technology accelerators coming from service providers to address regulatory pressures such as the audit and due diligence reporting back to CFPB, which is increasingly getting more complicated and frequent. Clients expect more guidance and recommendations in regulatory changes and their impact on technology systems/processes/data to maintain compliance. And what are the HfS Predictions for the Next 2-3 years of Mortgage As-a-Service? Greater Alignment of Services Around MOS Platforms: Service providers like Wipro, Accenture and Genpact that have made investments in acquiring MOS technology vendors have goals of providing a broader, end-to-end portfolio in mortgage, including people, process and technology. This is an indicator of a vision for providing Mortgage As-a-Service. However, most of the acquisitions made were of independently branded software solutions, accompanied by their own branding legacies. Infosys took a different approach with its startup acquisition to create CreditEdge. In the next two years, we expect these service providers to further articulate and demonstrate how these technology buys change their value proposition, towards greater clarity and examples of delivering Mortgage As-a-Service. Mainstreaming of Process Automation: It has taken a while for process automation to cautiously make its way to the forefront of conversations in mortgage operations, due to its troubled “robosigning” past. We are now seeing greater understanding by both service providers and buyers to start thinking practically and implementing different kinds of automation technologies (RPA, intelligent OCR, etc.) across various parts of the mortgage services value chain. Today thus represents the early vanguard and the arrival of RPA in mortgage, leading us to believe that adoption will be fairly rapid over the next 12-18 months. Digital Driving Disruption at the Top: Several of the big lenders that HfS interviewed are still playing the “wait and watch” game on digital disruption, in particular the strides made by fintech startups and non-traditional banks in the mortgage industry. While “push button, get mortgage” as we discussed above might not be the path for all the Top 50 to go down, lenders are initiating more conversation and strategy around how digital components can help them look at traditional operations differently. Service providers will have a big role to play in this, from a process reimagining perspective, as well as ultimately configuring the digital components that link these activities back to onboarding and origination platforms. HfS premium subscribers click here to access the new HfS Blueprint: HR Mortgage As-a-Service 2016.